First things first, the reason you’re here is probably the fact that you really like vintage fabrics. 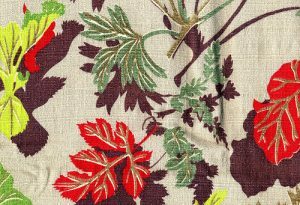 After all, when it comes to vintage fabrics, there are not many options better than the Barkcloth fabric. However, it’s still one of the lesser-known fabrics you may have come across, and hence you can certainly do with reading a guide that explains everything there is to know about the barkcloth fabric. Before we start talking about barkcloth fabric though, it’s important to note that there quite a few types of the barkcloth fabric, including the atomic barkcloth fabric, the mid century barkcloth fabric, the Hawaiian barkcloth fabric and more. The ideal option for you may depend on your preferences, for what you will be using the fabric, as well as perhaps even the budget as the prices can vary quite a bit from one type of barkcloth fabric to another. Anyway, with that said, let’s try to get familiar with what we think is one of the better types of vintage fabrics. Barkcloth is actually a very versatile type of fabrics that was used most commonly in Asia, the South Pacific and its surrounding areas, as well as some other regions across the world. It’s made from the bark of a certain type of tree found in the South Pacific, which is how it got its name. The bark of the tree is soaked, beaten into very thin sheets, and used to make a variety of items, including the barkcloth fabric. The barkcloth fabric initially used to be a paper-like fabric, which used to be processed by the way of dying, printing or painting in order to make it ready to be used for making different types of clothes. However, the traditional barkcloth fabric has since long been replaced by its modern version, which is basically a cotton fabric featuring a very dense weaving process, and something very easy to sew on using a sewing machine. This is obviously different from the vintage barkcloth fabric, which still very much has the traditional paper-like feel albeit it may not be as versatile as its modern version. The modern barkcloth fabric gets its distinct appearance not from the fiber of the fabric itself, but rather the texture it sports. However, this is actually in a good way, as it helps the fabric retain the look and feel of the tree bark that’s known for its rough, textured appearance. That said, the vintage or reproduction barkcloth fabric seems to be gaining more importance lately, thanks to the natural barkcloth fabric getting the modern fashion designers interested. This is also why you see many fabric websites having reproduction barkcloth fabric on sale, as the demand seems to have picked up lately which may be a good opportunity for them to gain new customers. The vintage barkcloth fabric has actually been used in Uganda since many centuries for making clothes. In fact, even today, it’s widely used for making clothes for special ceremonies that primarily include weddings and funerals. With some of the well-known modern fashion designers endorsing its use for making different types of clothes, it’s no wonder we now also have barkcloth upholstery fabric being sold, which is one of the more unique fabric options for your upholstery. As we mentioned earlier, the barkcloth fabric is actually one of the more versatile fabrics you will find on the market. It’s not very popular, but if you like the look and feel of vintage fabrics, you will probably love what the barkcloth has to offer. Now, something worth noting here is that as the barkcloth is so densely woven, it’s also very durable. You may have heard about the kind of unique appearance the barkcloth fabric boasts of, but the fact that it’s also very durable is not very commonly known. However, the kind of durability it brings to the table makes it a great fabric for making many types of cloths that tend to take a lot of beating over time, including curtains, cushions, as well as being used as an upholstery fabric. The superior durability and unique looks of the barkcloth is precisely the kind of combination you need when getting a fabric for your upholstery. Similarly, you also can’t go wrong with using it for making your accessories. It comes in many different designs that are very vibrant and bright. And when coupled with their durable texture and considerable weight, they offer pretty much everything you could demand in a fabric you would use to make accessories that are capable of withstanding a high level of wear and tear. On the other hand, however, the barkcloth is not as commonly used for making garments. The weight and the rough texture makes it a little less desirable to be used for making garments and clothes, especially the ones you will be wearing over the summer. However, if you can live with these downsides or are looking to make clothes to wear during the winter, there’s probably no reason to not use it for making clothes. This is especially given the kind of prints the barkcloth fabric is capable of sporting, which makes it an excellent option for skirts or even dresses. The vibrant, colorful fabric can go a long way in helping you make something well out of the ordinary, but in a good way. If you’re knowledge about fashion trends and the latest types of clothing out there, you know that the combination of a modern design and a vintage feel is very hard to come by. But guess what? It gets incredibly easier to achieve with the barkcloth fabric, although you do need to put in some time to come up with an idea that would work well. A small piece of advice we would give is to go for a vintage pattern that has a contemporary feel and look, rather than a completely modern design. We recommend purchasing your barkcloth fabric at Amazon.com or Fabric.com. They have the widest selection of affordable, quality barkcloth fabric. Head on back to Chapter 5: Fabric 101!